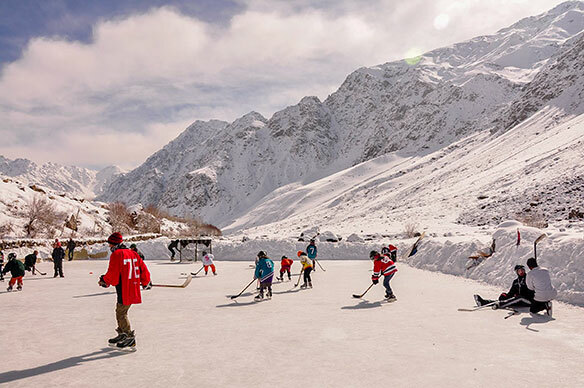 Adam Sherlip is inviting people to take in a little Hockey Night in Ladakh, with entire games certain to be true high-lights. Sherlip is executive director of The Hockey Foundation, which “uses hockey to change lives around the world” for the better, and the foundation is touting the Feb. 5–7 Hockey Goes Higher tournament in the lofty Indian region of Ladakh, with organizers wanting the Guinness Book of World Records to recognize the contest as hosting the world’s highest hockey games. Games will be played around 14,000 feet. The idea of a hockey tournament in cricket-loving India, much of which is covered in humid jungle or scorching desert, might leave some scratching their heads. But wintery Ladakh is in the Himalayas and is distinctive culturally, Sherlip reports. Sherlip says local hockey skills are improving, thanks in part to equipment donated by The Hockey Foundation, but are somewhat hampered by limited hockey facilities. The foundation has bought international regulation rink boards from Europe and shipped them to Ladakh for the event, after which they’ll be donated to locals. The caliber of players planning to participate for the upcoming event ranges from beginner to semi-pro, and it’s open to all who love the game. Registration is still open and costs US$750. Most players will be North American or European, but there will also be Ladakhis. Ladakh’s tourist trade has traditionally relied on trekkers wanting to explore the Himalayas, and Sherlip acknowledges that the world’s highest mountain range is the “star of the region.” But he adds that trekkers and mountaineers who also appreciate hockey can take in some matches with locals who Sherlip says are certain to be enthusiastic. More information can be found at www.generosity.com/sports-fundraising/hockey-goes-higher-with-altitude . ‹ Madrid ignites your senses!